You can help grow Green America’s work for generations to come. Planned giving, either through one’s will or a financial instrument, is a way to ensure that our work together for a more just and sustainable society continues into the future. Include Green America in your will. “I hereby bequeath to Green America, a non-profit corporation, headquartered in Washington, DC, and with a tax identification number 52-1660746, __________ (insert percentage of estate or dollar amount) to be used for general purposes as determined by the Board of Directors." Designate Green America as a beneficiary in your life insurance policy, IRA, or retirement. Your life insurance, IRA, 401(k), or 403(b) plans also allow you to name multiple beneficiaries. You can designate Green America as one of your beneficiaries. Green America accepts gifts of stock as a charitable contribution. Giving gifts of stock can save you capital gains tax and result in a charitable deduction on your tax return. Put Your IRA to Work for People and Our Planet. If you are 70 1/2 years of age or older, you can make a tax-free charitable gift from your IRA to support Green America. You can direct your required minimum distributions (up to $100,000) to Green America, avoid income tax on the distribution, and enjoy the satisfaction of your gift going to work immediately to support our work for justice and sustainability. 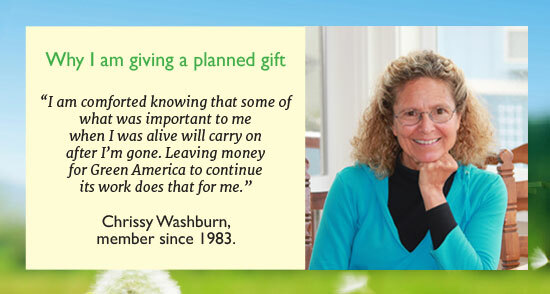 Please let us know if you have made a planned gift to Green America so we can thank you now for your legacy gift! You can choose to remain anonymous, and we always respect that choice. Legacy Society members receive special updates, invitations to special events webinars on social justice and sustainability topics, and recognition (with your permission) as a Legacy Society member. Although our name has changed from Co-op America to Green America, our tax-ID number 52-1660746 remains the same. To discuss your planned giving options, or let us know you have already arranged for a gift to Green America, contact Kathy Harget, Director of Development & Organizational Advancement, 202-872-5330, kharget@greenamerica.org.